One of my computers has been unstable for quite some time now. It had been crashing and freezing up once a while in the past, but it has become noticeably worse in recent months and sometimes the computer would crash just minutes after boot up. And any of the problems mentioned above could have caused behaviors similar in nature. So I needed to isolate the cause first. Dust is one of the first things came to mind. After all those years of use, the inside of the computer has become quite dusty. Dust can do a lot of weird things. It can obstruct airflow and cause some components to overheat. It can absorb moisture and cause circuits to short. And in some cases, it can also change the capacitance of the circuit and causes the system to malfunction. So the first thing I did was a thorough cleaning job. I even took the CPU heat sink out and got the dust between the fins out. I then reapplied heat grease and re-seated the heat sink. Well, as it turned out dust was not the problem. After I cleaned the computer, the problem remained. But it certainly did not hurt to eliminate this possibility first. After some quick checking, I had pretty much eliminated all software related issues as I would get the same symptom with different operating systems (either Windows or Linux). And it does not seem to be a driver conflict either since neither OSes reported any such problems and there has not been any hardware changes on this computer for years. The memory chips seemed to be working fine as well. I swapped in some spare memory DIMM’s and experienced the same instability issue. I had also double checked all the cable connections to the motherboard and everything seemed to be in good shape there as well. Extensive harddrive testing showed no sign of a failing hard drive either. The power supply seemed to be in good working order as all the voltages readings are within spec when the system is under load and swapping out the power supply with a spare one did not alleviate the random crash situation. So this leaves me with the latter two possible causes. Since I built this particular computer about ten years ago, I began to suspect that the motherboard might have begun to fail due to bad capacitors since there was a capacitor plague right around the time I built this computer. After all, the motherboard is an Asus P4P800E Pentuim 4 board and there has been many reports of failing capacitors on this board. After a careful visual inspection of the motherboard though, I did not find any capacitors that were definitively bad. 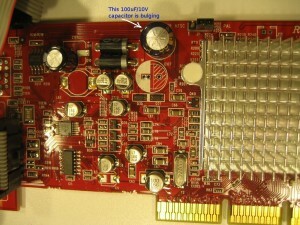 Unfortunately, to truly determine whether a capacitor has gone bad or not would require taking the capacitors off the motherboard first so that they can be reliably measured. Since there are more than a dozen capacitors that could have been the problem, I decided to eliminate all other possibilities before resorting to this last resort. The only thing left then was the video card. It is a Radeon 9200 SE. I took the card out of the case and did a quick visual inspection. At first glance, everything looked normal. 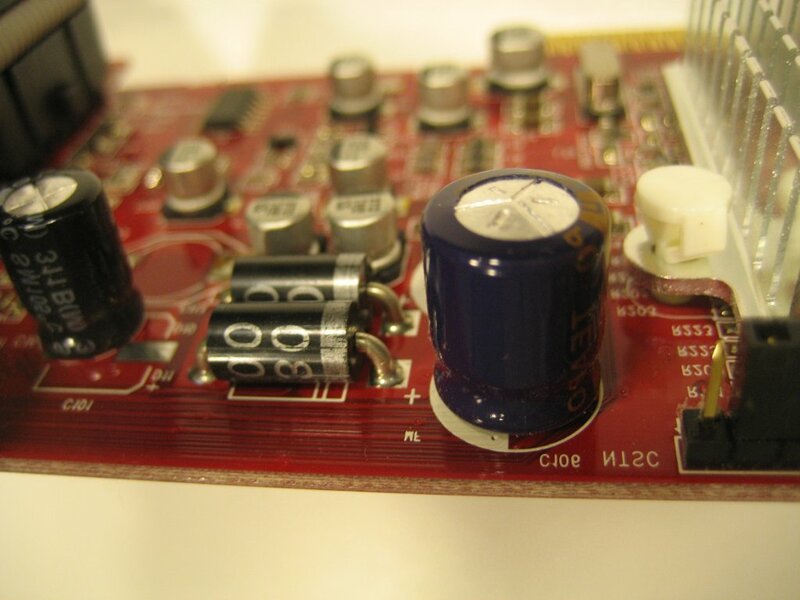 But after a closer look, it seemed that the main filter capacitor (see picture below) was bulging out a little bit. Couldn’t this be the problem? Here is another picture of the same capacitor. The bulge was not very obvious, but the capacitor could definitely have failed. Since this capacitor was easy enough to remove, I de-soldered it from the board and measured its capacitance. Sure enough! The 1000uF/10V rated capacitor only came at around 200uF when measured. And since this is the main power filtering capacitor on the video card, it could definitely affect the stability of the card if this capacitor is malfunctioning. Now it became clear that this capacitor was indeed the culprit. And after I swapped out the bad capacitor with a new 10V/1000uF one, the computer has not crashed once since.